This peer-reviewed journal serves as the Society's principal repository for engineering applications in the agriculture and bioresource industries. 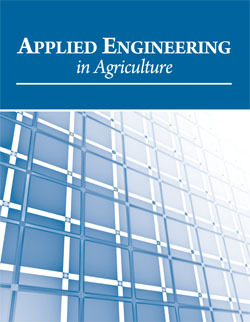 The American Society of Agricultural Engineers publishes Applied Engineering in Agriculture six times a year. Open Access may be purchased for your article. Accurate spatial characterization of field capacity (FC) and root zone available water capacity (R) can enhance site-specific management practices such as variable rate irrigation to lower input costs, reduce contaminant leaching, and/or improve crop yield. Measuring the volumetric water content after wet soils drain following substantial precipitation can provide a field estimate of FC. The Ecological Engineering (NRES-28) and Streams, Reservoirs, and Wetlands (NRSE-25) Groups are co-sponsoring this collection. Topics could include, but are not limited to, resilience of natural, restored, fresh, and coastal wetlands to environmental and human-driven change; capacity of wetlands to increase interconnected systems’ resilience by providing ecosystem services (e.g., water quality improvement, carbon sequestration, wave attenuation, water storage, habitat); and methods for monitoring and analyzing wetland ecosystem service resilience using high-resolution measurements, including field, lab, remote sensing, and data-intensive techniques. Submit your manuscript any time before 1 March 2019. Benefits from the collection include the first three pages being free and free public access through 2021. Please forward the call to other potentially interested parties. If you have questions, please contact Kyle Douglas-Mankin or Tiffany Messer. The collection will focus on water security for producing food, fiber, and energy crops as well as maintaining water quality and quantity for ecosystem health and services. The Collection will include manuscripts selected from conference participants as well as from invited experts. It builds on the recent Global Water Security Conference for Agriculture and Natural Resources held at Hyderabad, India, October 3-6, 2018. The high quality of ASABE peer­ reviewed journal publications could not be maintained without the dedicated service of associate editors, who spend hours working closely with reviewers, authors and editors during the peer review process for each manuscript. Our peer­ reviewed journals could not be successful without reviewers willing to spend hours evaluating author manuscripts and making suggestions for improvements.